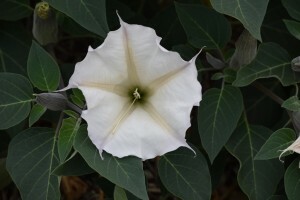 A jimson weed, as featured in Georgia O’Keefe’s top-selling “Jimson Weed/Flower No. 1”. This is the second year that fine art site Artnet has conducted a survey of the highest-selling female artists to date. Recent auctions at both Christie’s and Sotheby’s have catapulted new artists into the top ranks of high-selling women artists, knocking fan-favorites, like Yayoi Kusama off of the list. After these huge art sales, Artnet has renewed their list of the highest-selling women. These are the top five women. Natalia Sergeevna Goncharova was a prominent artist at the forefront of the Russian avant-garde movement in the 20th century. Not only was she successful in the Russian avant-garde movement, but her art has also seen huge success on the art market. In the past, Goncharova’s Picking Apples (1909) sold for $90.8 million and her Espagnole (1916) sold for $10.2 million. In 2008, Goncharova’s prior record was beaten by the sale of Les fleurs (1912), which sold at Christie’s London for $10.8 million. Berthe Morisot is a master of the impressionist style, whose works have often fetched high sums at auction. Her highest-selling piece is Après le déjeuner (1881), which sold for $10.9 million at Christie’s in 2013. Coming in at number three is Joan Mitchell’s Untitled (1960), which sold for $11.9 million at Christie’s New York in 2014. Joan Mitchell is a beloved abstract impressionist whose art has been reaching new heights in terms of value at auctions. When Untitled (1960) sold, it set a new record for all women artists at auction. Earlier this month, Mitchell’s Noon (1969) sold for $9.8 million, proving that confidence in her art is still strong. Louise Bourgeois comes in second with a bronze sculpture, rather than a painting. Spider (1996) reached $28.2 million at a Christie’s Post-War sale last fall. The imposing bronze sculpture stands nine feet tall, literally towering over its competition. In 2014, Georgia O’Keeffe’s Jimson Weed/White Flower No. 1 (1932) was purchased at Sotheby’s by Arkansas’s Crystal Bridges Museum for $44.4 million. O’Keeffe’s painting stands as the most expensive painting by a female artist. The work was displayed at the Crystal Bridges Museum the following spring. Like us on Facebook, follow us on Twitter, and share with your friends. This entry was posted on Friday, May 27th, 2016	at 1:13 pm	and is filed under Art News	. Both comments and pings are currently closed.